Both my mother and my grandmother dealt with arthritis pain. When I was a little girl, my grandmother Catherine held up her gnarled hand with crooked fingers and told me, “This is what happens when you crack your knuckles. Never crack your knuckles.” While most studies seem to have found no correlation between knuckle cracking and arthritis, the image of grandma's hand has stuck with me, and I know arthritis caused her pain. Mom never said much about it, but I'd see her rubbing her joints, and she always wore copper bracelets for the last several decades of her life. Just recently, I was talking to my neighbor, Betty. She told me that a friend of hers was on arthritis medication that knocked out her immune system so badly that she couldn't kick a simple cold. 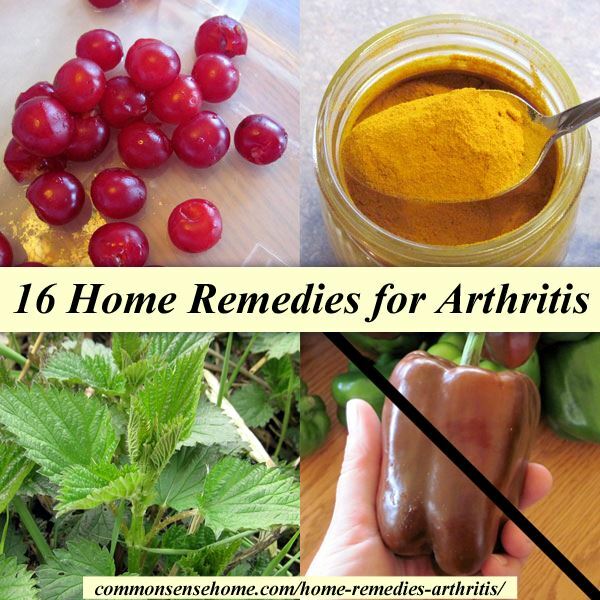 Her story inspired me to write this post and assemble a list of home remedies for arthritis to provide her with some natural treatment alternatives. There's an old saying, “If you rest, you rust.” Although moving may be painful, it is critical to promote circulation and prevent muscle atrophy. Good circulation stimulate healing, and strong muscles help you to maintain good posture and move correctly so you don't cause additional damage. Try low impact exercise like swimming, water aerobics, walking or gardening (get help for heavy lifting if needed). Gardening can also help reduce stress, which reduces inflammation, heal your mind, and improve your diet. Read more in the article “8 Health Benefits of Gardening“. There's more than one reason people move south when they get older, but I bet pain relief is a motivator for many. I know even my husband feels pain in his hand joints when the temperature drops. He got frostbite in one hand back when he was in the Air Force National Guard, and it's bugged him ever since. (He keeps trying to talk me into moving to Texas.) This winter was pretty uncomfortable. Use a hot tub or a sauna (IR saunas are great therapy for detoxing and have been recommended for treatment of many auto-immune conditions), soak in a warm pool or bath tub, wash your dishes in a nice sink of warm water, try a heating pad, hot pack or arthritic therapy gloves on the affected area. Just don't go to sleep with an atomic heating pad that doesn't have a timer on it. I don't want to see anyone burn their house down. We live near Door County, WI, one of the biggest tart cherry producing areas in the U.S., so I have to give a shout out to tart cherries for arthritis. The Arthritis Foundation notes that cherries, cherry juice concentrate and cherry pills have been tested and found to be effective for treating gout-related arthritis and osteoarthritis. Volunteers consumed at least 10 tart cherries per day, one tablespoon of tart cherry concentrate twice a day, two eight ounce bottles of tart cherry juice per day, or one cherry capsule per day. It is likely the pain relief is linked to anthocyanins, which are antioxidnts found in red and purple fruits. You can read the details at “How Cherries Help Fight Arthritis“. Apple cider vinegar is the most popular recommended arthritis home remedy on Earth Clinic. Folks take between 2 teaspoons to 1/4 cup daily, usually mixed into a glass of water, and sometimes with a little honey for sweetening. Dosing morning and night seems most common. I wouldn't advise sipping it all day, as the acid could wear at your teeth just like acidic soda. Stinging Nettles (Urtica dioca) have been using topically and internally to fight arthritic inflammation. The University of Maryland Medical Center Stinging Nettle article states that ” an oral extract of stinging nettles” has been used to decrease inflammation, resulting in reduced NSAID use. Nettles are more commonly used to treat arthritis via urtication. Urtication is the practice of flailing the affected joints with fresh stinging nettle plant. It may sound crazy, but this remedy has been in use for a very long time. You can read more about it in the Mother Earth News article “Use Natural Remedies for Arthritis Pain“. Nettle is a fairly common weed that likes to grow in high nitrogen soils, such as the soil near barnyards. You can read more about nettles in Weekly Weeder #16 – Stinging Nettles. Alfalfa, Medicago sativa, is high in vitamins A, C, E and K4 and the minerals calcium, potassium, phosphorous and iron. It has been used to treat a variety of conditions, including arthritis (both osteoarthritis and rheumatoid arthritis). The herb is taken as a tea or tincture. To make alfalfa tea, simply steep a teaspoon of the dried herb in boiling water for about ten minutes. Strain and serve. Note: Alfalfa may interact with blood thinners, birth control pills, estrogens, immunosuppressants, and medications that increase sensitivity to sunlight. Read more about alfalfa interactions at WebMD. For more herbal remedies, don't forget to check out the Online Herbalism Course from the Herbal Academy. Vitamin and mineral deficiencies cause or aggravate many conditions, and arthritis is no exception. Vitamins D, E, C and B6 have been shown to improve symptoms in certain individuals. Zinc. magnesium, beta carotene and other supplements have also been shown to provide relief. My friend, Carol, mentioned that she had been suffering from joint pain as she got older. While working with a natural practitioner, he suggested that she eliminate nightshades from her diet. Carol is a pepper lover – she can eat bell peppers straight like most people eat apples – but she agreed to give it a try. It worked. Pepper free equaled pain free for her. Members of the nightshade family (peppers, tomatoes, potatoes, eggplant, ground cherries, tomatillos and Cape Gooseberries) contain a compound called solanine, which is a mild toxin. The amount of solanine in an individual fruit is very tiny – but some people are sensitive to it. Fish oil and fish liver oil contain omega 3 fatty acids, which reduce inflammation. The University of Maryland Medical Center recommends one tablespoon of fish oil per day. Note: omega 3 fatty acids may increase the risk of bleeding, especially if you are on blood thinners. The University of Maryland Medical Center cited a study that indicated Glucosamine/Condroiton supplementation seemed to be most effective for those with moderate to severe osteoarthritis of the knees. The supplements had to be continued over several months to see results. This is another one that may interact with blood thinners, so be careful. Along with nightshades, some other foods may act as arthritis triggers, contributing to a build up of toxins or waste products in the affected tissue. Refined sugar, gluten, foods high in oxalic acid (such as rhubarb, gooseberries, and raw spinach), caffeine, alcohol, red meat, eggs, dairy and others may increase discomfort. Try switching out different elements of your diet, and drinking more water (with a splash of citrus or vinegar) to see if you feel any different. This probably isn't a home remedy for those of us who don't have an apiary, but bee venom therapy (apitherapy) has been shown to provide relief for RA sufferers. 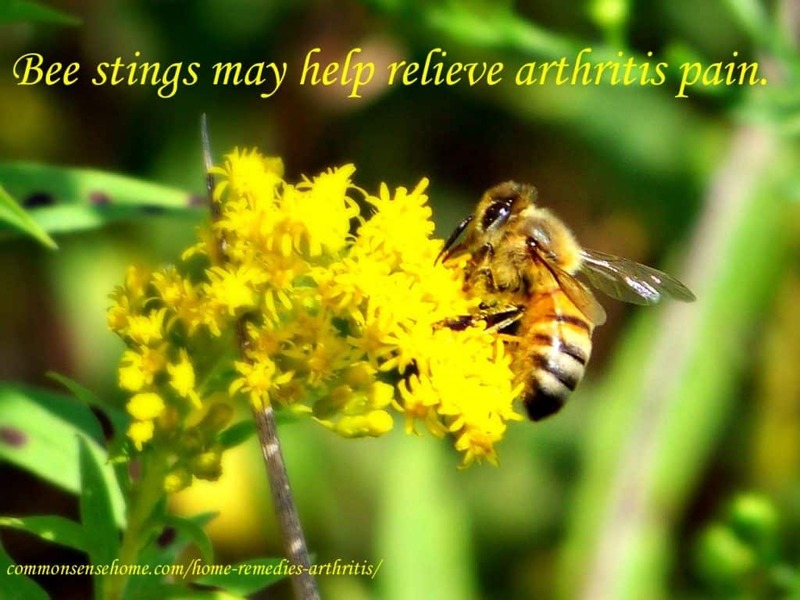 See “Clinical randomized study of bee-sting therapy for rheumatoid arthritis” and “Sting the Pain Away” for more information. Regular consumption of ginger, fresh, dried or in tea, may be better for arthritic pain relief than NSAIDs. Try using fresh or dry ginger in cooking, or make a ginger tea. To make tea with fresh ginger, slice or chop about a teaspoon of ginger per cup, cover with boiling water, and steep for 3 to 10 minutes. Strain out ginger chunks and sweeten with honey if desired. Dilute 1-2 drops of your oil of choice into 1 tablespoon fractionated coconut oil or massage oil of choice and use as a massage oil on the affected area. As I mentioned at the introduction of the post, my mom wore copper bracelets for arthritis pain relief for many years. First she had a set of bangles, then a solid copper band. The official word from the medical establishment is that copper bracelets work no better than a placebo for arthritis. Of course, most of the medical establishment is still handing out statin medications like PEZ, too. (Want to lower your cholesterol? We've got other options.) Mom felt it helped her, and other people swear by copper bracelets, too. I'd put diet and lifestyle changes first, but I wouldn't be afraid to give copper bracelets a try, too. Besides, copper bracelets look cool! If you or someone you knows suffers from arthritis, I hope this article will help you relieve the pain. This post is provided for informational purposes only and it not intended to diagnose or treat any illness. Please contact a trained healthcare provider if pain is severe or debilitating. Always check with your healthcare provider before starting new supplements, especially if you are already taking medications, to avoid possible interactions. Be smart, stay safe! Thanks for the information, I had forgotten about a few of these remedies. I’m going to buy cherry juice this weekend! Gin soaked raisins about 10 a day. Let the raisins soak a few days in a covered jar and have a spoon full of raisins about 10 each morning. Does it have to be gin, or would vodka work? One way to find out for sure…. If i remember it’s only gin, as it’s extracted from, juniper or something in that family I believe, but I do remember that there was something special about gin. But looking a A Modern Herbal, nothing jumps out and suggests juniper for arthritis. Curious. I also read of a man who sufferred the pain of arthritis so bad that one day in desperation he ‘flogged’ himself with sprigs of stinging nettle which in itself would produce an incredible amount of pain and discomfort but after it abated he had considerable relief from the arthritis. .. Yes, the nettles work in a fashion similar to the bee stings. This is by no means an exhaustive list of remedies, but the post was getting pretty long. Thanks for bringing that one up! No on the heat for me. It makes it hurt worse. GO figure. I take fish oil, turmeric, Glucosamine/Condroiton supplementation, Butcher’s Broom and Devil’s Claw. And if I forget to take for awhile, I am waking up screaming. Wait! Wait! What happened to number 5??? I have an insatiable curiousity! Also, have you read much about turmeric in powdered form being difficult to digest? When I looked up different pills and tablets, their descriptions do mention that some are more easily assimilated than others; and those that are, are so much pricier. I’ve been fermenting fresh turmeric root and making it into a soda that I drink everyday. I’d like to hear what you think about turmeric’s bioavailability, or lack of it. Wellllll… there may be a possibility that yours truly was tired and muffed her numbering. I have added a familiar favorite in for number 5 – stinging nettles. As for the turmeric, I generally prefer to use whole herbs. Most sites suggest it’s absorbed better when paired with black pepper, or black pepper extracts. I am using cúrcumapowder/tumericpowder for about a year now. I mix it with extra virgen oliveoil and and a bit of ground black pepper. On the internet I did read that cúrcuma alone was very poorly absorbed by the body and when mixed with something like grease as coconutoil, extra virgen oliveoil etc. the absorbtion became much better. The ground black pepper increases the effect of cúrcuma many times. In this way I healed my highly infected sciatica nerve and with movement, walking, and excercises from my physio I am painfree of sciatica. But the problema with the arthritispain in my right hip and both hands is that through the joints passes a very little amount of blood so the medicin has problems to reach the spot. Now I bought ginger powder that I will mix in my tea and drink it trough the day. Hope it will help me just like the cúrcuma did and does because I still use this as maintenance. Also living in a tropic country releaves the pain. Sorry for my English but I am Dutch and living in Costa Rica. Thanks for sharing your experience, Rien. I hope the ginger powder is helpful. How do you ferment turmeric? My husband is a pianist and has arthritis in his thumbs. I bought him a paraffin wax spa for hands. Not only does the heat help his fingers but he has nice soft hands too. Win, win! My MIL used to use one of those and said that she felt it helped, too. In the last year I have just about lost the use of my knees from Arthritis. I did a lot of what you have above and didn’t see any improvement until I added the Magnesium and an herb called Cat’s Claw. I am doing a lot better now but it is a combination of things from above. There is no one “magic pill” fix. Thanks for sharing your experience, Greta. I’m surprised the combination of cinnamon and honey did not make your list. I suffer from psoriatic arthritis and take 1000mg of cinnamon in a capsule form with a teaspoon of raw honey every day. It takes about 6 months before you start to have relief. Before doing this I the pain in my knees was excruciating. I looked like I had two knees in front and one behind from the swelling. Now my knees look normal and my pain has been reduced by 75%. My friends with MS have experienced relief in their symptoms as well. I have a buddy with Lymes who called me recently to thank me for telling him about this. It has to be taken everyday to work and cannot be used by diabetics. I’m not a doctor, Just sharing what works for me. Thanks for sharing your experience, Susan. Fortunately I don’t have to deal with arthritis yet, so I haven’t personally had a chance to try any of these to see if they work for me. I found this article very interesting. I have tried the fish oils, the glucosamine chondroitins, the bee sting therapy. I am now using a Calcium,Magnesium,Zinc supplement combined with a MSM supplement 3x a day. It was helping but now my knees are getting much worse but it does help my Fibro a lot. I know I am supposed to exercise but the pain in my knees is just too overwhelming. I am going to try some of your remedies. I have to be careful because the doctors burnt my stomach out with NSAIDs. Do you get enough vitamin K2 (not K1)? If you’re getting joint pain after adding calcium supplements, it might be that the calcium is building up where it shouldn’t be – in your joints. Most Americans are deficient in K2. The best food source is Natto, which we don’t normally eat. Gouda and Brie also have a fair amount, and goose liver pate. I highly recommend the book “Vitamin K2 and the Calcium Paradox: How a Little-Known Vitamin Could Save Your Life“. I had no idea that this little known vitamin was so critical to making sure that the calcium we take gets where it needs to be – in our bones – instead of in our arteries and joints. Although tart cherries are more widely promoted, sweet cherries may also be helpful. Check out this video for an excellent discussion of using cherries to treat gout. Very nice list, one thing i’m liking about natural medicine is that so many things can have multiple uses, I eat tart cherries, but to help sleep, and we all must remember what helps one person may not help someone else, I tried glucosamine chondroitin, and the only thing it did was make me vomit, but nature has given so many other things i love, especially those cherries. Wonder how they aid sleep? Maybe because they are rich in minerals? Tart cherries were recommended to me in combination with almonds (both are rich in trace minerals and are synergistic together) as a way to give me greater resistance to problems from severe electro-sensitivity. A week or two after I started eating 3 or 4 of each a day headaches and an irregular heartbeat faded and 3 years later I am far more tolerant of being near poorly shielded equipment. Sleep was never an issue. Enervation, bran fog and lack of stamina are now in the past! By the way, last year’s tart cherry crop suffered from a lack of sun and too much rain. They were extra tart and dry. The 2016 crop is much richer in color, and so much sweeter they are shiny and sticky from fruit sugar. I get mine from http://www.cherrylandsbest.com/. Their current price on 2 lb bags of unsweetened red tart cherries is $31 . Just received this week’s newsletter – it was awesome as far as information goes. My husband is suffering with three forms of arthritis and knows the dangers of the medications the doctors put you on. He took himself off of them and I’m going to get on the bandwagon and start trying to help him the natural way. Thanks again for the all the info. Glad you liked the newsletter, and I hope you find a solution that works for your family. Every body is different, so it can be challenging. Great article! I have been reading the comments and it’s nice to hear people get some relief. As someone who is into nutrition, everyone is deficient in certain minerals due to modern farming practices and when you are deficient in one mineral, it causes weakened tissues and deterioration. Also if your body is acidic, you will have deterioration! The only time a body should be acidic is when we die and it’s decomposing but since you are still living, your body is always under stress to combat the deterioration going on while your body is trying to heal it! Supplementing with Trace Minerals will help tremendously in time. You may notice changes in 6-12 months or even a couple of years but your body will thank you! I have been dealing with degenerative disc disease and had fusion done in my low back which slows me down considerably but I’ve noticed improvements over the 4+ years that I have been taking Trace Minerals. Also, Bone Broth will give you the glucosamine and condroitin that you need for your joints! You can rebuild cartilage! I enjoy roasted chicken and generally do two at a time with the beer can chicken stand and use a heat proof glass with my own seasonings and save the carcases and drippings until I get about 6-8 carcases in the freezer, then i make a batch of broth. You can use a slow roaster which is nice because Bone Broth needs to be simmered for 12-18 hours! With a larger batch, you don’t have to make it as often! Then you can put it in jars and can it or freeze it. I forgot to mention adding egg shells to your Bone Broth! The membrane lining is rich in hyaluronic acid and will replace the synovial fluid in your joints. When you’re lacking in synovial fluid, your joints feel dry and grinding when you move and in time will cause degeneration! It’s amazing how something so simple can help so much!!! Or people can take 500 mg of eggshell membrane supplements but why pay for it when most people just throw those egg shells away anyway! I look at Bone Broth as free food because it’s made with what people just throw away and it has soooo many benefits! Thanks, Cindy. I hadn’t thought about putting the shells in, too, but it makes sense. You’re welcome! I should also mention to anyone who doesn’t know the difference between Bone Broth and regular broth… Bone Broth is started by soaking the bones in water with a Tbs. of vinegar for an hour before simmering. This softens the bones so you can extract more nutrients. Swamp pennywort is very good for arthritis also. Diatomaceous earth is awesome for arthritis. arguably even better: Borax. 20 Mule Borax is like $4 a box which is like a year supply. Changing the sitting posture and changing your lifestyle also can help to reduce and stop the pain. For example, if you are suffering from back pain, instead of sitting on the bed, try sitting on the floor. I am suffering from back pain since two weeks. I tried every medication. But every time I take medicines, the pain reduces, but reoccur violently. So i tried sitting on the floor with a yoga sukhasana posture and now I feel a remarkable relieve in my back pain. My grandmother swore by sulfur water. Several decades ago, there was a public faucet tapping into the sulfur well at Sulfur Dell in Nashville. My grandparents went there and always had sulfur water in their refrigerator. Unfortunately, the well was discovered to be polluted and shut down. My grandmother’s arthritis got a lot worse after that. Interesting. I wonder if high sulfur vegetables like kraut would have also been helpful? Possibly, although we ate cabbage and kraut; in those days we ate better because there was less overprocessed food available. But I have read that sulfur is an important but overlooked food element. My grandmother had had her gallbladder removed and had trouble digesting onions, which she loved. They also are a source of sulfur. I don’t know if the gallbladder helps digest other sulfur-containing veggies or not. If I had a good local source of sulfur water, I’d probably drink it based on her experience. The gall bladder helps us digest fats. The antibiotics associated with surgery may have killed off your grandmother’s natural store of gut bacteria and drained her of enzymes that she needed to digest the sugars in the onions. After decades of dysbiosis and abdominal surgery, I couldn’t digest cooked onions, garlic and a lot of other foods but was fine on raw, which were loaded with enzymes and lactobacillus. I was told this was due to stressors depleting my natural store of enzymes and now we also know how important our microbiome is to proper digestion and optimal health. Glad you remember your Grannie with love and sympathy, and she is still teaching you!